A child born in 2014 in Oglala Lakota County in South Dakota, home to the Pine Ridge Indian Reservation, has a life expectancy of almost 67, according to data from the Institute for Health Metrics and Evaluation (IHME). But a child born that year in Santa Clara, California, could expect to live to 83. And in Summit County, Colorado, home to ski resorts like Breckenridge, a child born in 2014 has a life expectancy of 86.83 years — 20.1 years longer than the kid born in South Dakota. Life expectancy rose in the US between 1980 and 2014, according to a study analyzing this IHME data, which was published May 8 in the journal JAMA Internal Medicine. But there’s a large and growing disparity in the country: Inequality in life expectancy increased over that same period of time. In 1980, counties around the US had much closer life expectancies. Along the coasts and in central Colorado and Alaska, there was a huge increase in life expectancy over the past 35 years. In southern counties and in states like the Dakotas, however, there was little improvement (if any) over the same period of time — and decreases in some places — according to the study. 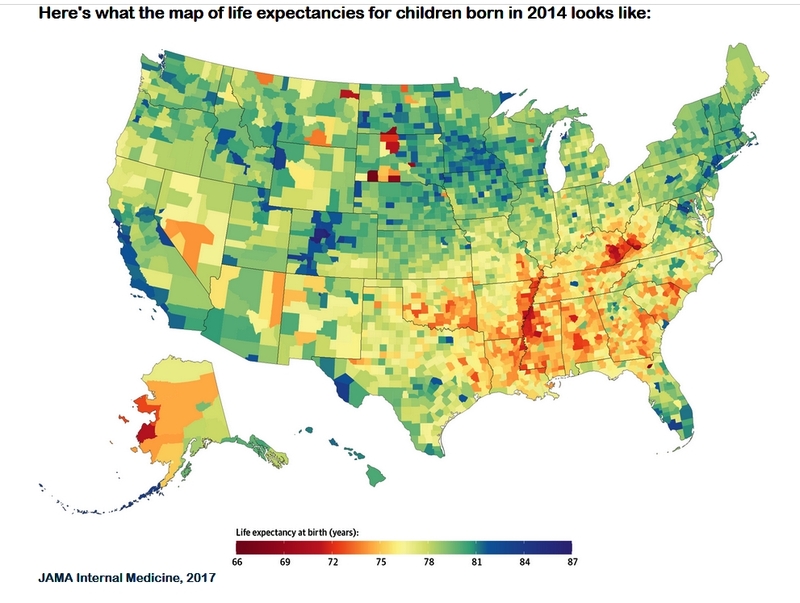 The data reveals that life expectancy is notably low in South Dakota, West Virginia, Arkansas, and Mississippi. California, New York, and Colorado have some of the highest expectancies. A large amount of the variation here is explained by socioeconomic factors, as well as race and ethnicity, behaviors like smoking and healthy eating, and access to quality health care, according to the researchers behind the study.